3-star-hotel in the 2nd district of Budapest. Address: 1025 Budapest, Szikla u. 9. 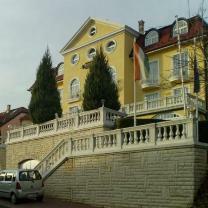 This classical style building is situated in the exclusive green belt of Budapest, close to a landscape-protection area. The clean air and beautiful garden that surrounds the building makes our guests forget how close the villa is to the city. The downtown can be reached in 15 minutes by car, 30 minutes with a public transportation. Villa Korda offers you the most beautiful view in Buda which has 21 rooms, 10 of them are provided with air-conditioning. Maximum occupancy is 45 person, privacy occ. 45 person. The hotel has 4 floors, and NO lift. Non-stop drink bar * Number of parking space 10 * Free internet (wireless connection, WLAN card is required) * A/C in the room (not in all) * Washing / Iron * Room with terrace * Hairdryer request on the reception * Cabel-TV * Telefon/Fax * Baby sitting * Non-Stop reception * Room-service * Safety deposit box avaible at front desk (free) * Copying / Printer / Fax * Car rental.